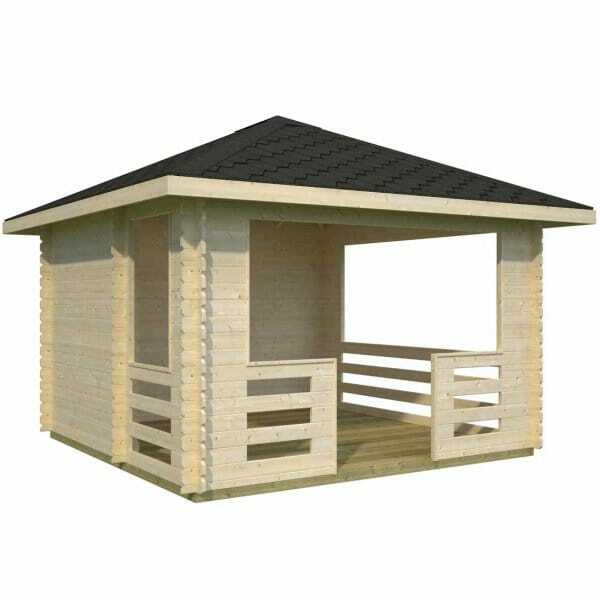 Palmako Julie 10.5m²: The Palmako Julie 10.5m² Square Pavillion is a large style Gazebo featuring 28mm wall planks. With its filled in back wall and partially filled side (Can be either left or right in relation to back wall) this gazebo cabin offers the perfect shaded area for a hot tub or garden furniture etc. as well as being a very attractive feature in the Garden perfect for enjoying in the summer months. The Palmako Julie is simply a Superb Value Gazebo. In common with the log cabins in the Palmako range the Julie features superb quality manufacturing and excellent quality timber. Review - Was looking for a log cabin to put around a hot tub, previous metal one blew away in storms. Did a lot of searching on Internet and visiting local shed / cabin suppliers and this seemed the best one for the job. Ordereded over phone and only paid in full once cabin was in this country. When the lorry couldnt get up street due to parked cars was worried but the fork lift on the back sorted it very quickly. The palet was huge, unpacked it all and treated with a wood preservative before construction. Took 2 of us probably 6 hours to build from base the sides and roof, took just me about a day in total to put on felt underlay and then shingles. Can not say how pleased we are with the end result, dead easy to construct and instructions are easy to understand. Having put a coat of wood finish on it it looks great, so pleased. Built it around the hot tub and is ideal for it, plenty of space around it and very solid, looks the business and when fully finished with floor will be perfect. Good price and great product. Was looking for a log cabin to put around a hot tub, previous metal one blew away in storms. Did a lot of searching on Internet and visiting local shed / cabin suppliers and this seemed the best one for the job. Ordered over phone and only paid in full a few days before delivery. easy to build - simply great!